loving ministry. As you read the following stories, please prayerfully consider how you can support these missionaries so that they, too, can leave a legacy of lives touched for Jesus. Laurie Falvo Editor To read Irene Wakeham Lee’s interview, “105 & Counting,” visit https://am.adventistmission.org/v6n2-16. Conference of Seventh-day Adventists®. Unless otherwise noted, Bible verses are quoted from the King James Version. The Runaway’s Gospel Even though I might get captured, I want to die with the hope of salvation. express her gratitude. She was deeply lonely and also anxious because she didn’t know when she might be caught. I could see all those days of anxiety and distress on her face. One day, while scrolling through the stations on the family’s radio, she thought she heard a little bit of Korean. Surprised, she dialed in to the Voice of Hope, an Adventist World Radio program produced by the Korean Union of Seventh-day Adventists. At first, she didn’t understand the presentations. But in time, they turned her loneliness and anxiety into hope, strength, and light to live by each day. Every morning and evening, she listened to the program, never missing an episode. Finally, she accepted Jesus as her Savior. Now, all she wanted was to have the assurance of salvation through baptism. Who could deny such a request? I asked her to stay put for one week before moving on, and we started Bible studies. She showed determined concentration and studied as if her soul were panting for water. At the end of the week, we had a secret, tearful baptism. Then she departed on foot while we prayed that her journey would be safe. we believe that we’ll see her again at the resurrection. In her loneliness and pain, this woman heard the voice of God through Adventist World Radio. The Voice of Hope program penetrated the darkness in her soul and became a source of eternal life. To protect the missionary who wrote this story, we have withheld his name and the name of the country where he serves. Adventist World Radio (AWR) is the international broadcast ministry of the Seventh-day Adventist Church. Programs are currently available in more than 100 languages via shortwave, AM/FM, on demand, podcasts, Call-to-Listen service, and solar audio players. AWR’s mission is to bring the gospel to the hardest-to-reach people of the world in their own languages. The “AWR360°” approach to outreach encompasses the entire journey of listeners from broadcast to baptism. To watch AWR mission stories, visit M360.tv/awr. Thank you for supporting AWR through your mission offerings and World Mission Budget offerings! a curse falling on her family. She stood up and announced with a trembling voice that she wanted to accept Jesus as her Savior and be baptized! It’s stories like Salma’s that inspire Sunny to continue serving as a “Waldensian Student.” “After I finish my studies, I plan to stay in the Middle East to develop lifelong friendships with people like Salma,” Sunny said. “That’s about the only way we can touch the hearts of many people who don’t know Jesus in this region. Please pray that Salma will grow spiritually and that God will send more people like her to me.” Chanmin Chung is the communication coordinator for the Middle East and North Africa Union Mission. Sunny participates in the “Waldensian Student” initiative, a frontline mission approach in which Seventh-day Adventist students live, study, and serve in secular universities in specific countries throughout the Middle East and North Africa. Following Christ’s example of outreach, they mingle with people, win their confidence, minister to their needs, and as opportunities arise, bid them to follow Jesus. For information on how to become a “Waldensian Student,” contact Questions@adventistmission.org. To sponsor their unique ministry, visit Global-Mission. org/giving and select the “Waldensian Student” program. Saipan to visit her brother’s family and to learn more about what had transformed his life. It turned out that God had timed Vivian’s arrival perfectly! Our church had planned a series of evangelistic meetings for the following week. She attended each night and was baptized, beginning a new life in Jesus and joining our church family. I could see hope in her smile and the peace of God in her eyes. God did have a plan after all. He took Joel with all his struggles and made him a powerful soul winner for his family. I never want to forget this experience that taught me that He’s always in control, turning the trials of this world into precious memories and successes. There will be a day when I see Joel in the kingdom with Vivian and the rest of his family, smiling and happy together, never to part again. Come soon, Lord Jesus. Kris Akenberger is a volunteer Bible worker living in Saipan, Northern Mariana Islands. Hear from other volunteers at m360.tv/avs. 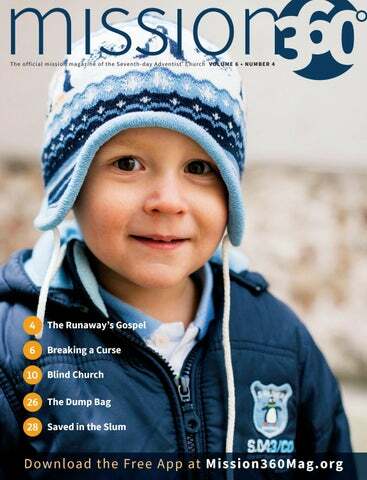 Blind Church W Beth Thomas is a freelance writer living in Maryland, United States, with her husband and two children. to meet other Christians, and have discussions about God and the Bible. I love worshiping with others and, most importantly, am privileged to have volunteers who dedicate their time to help people like me grow emotionally, mentally, and spiritually.” Earl began attending the small group in 2009 before it was formally recognized. His daughter, his girlfriend, and her son now join him when he comes to church. “Hope Vision Fellowship really is a place where my entire family feels comfortable,” he says. “The encouragement and support I’ve received from everyone mean more to me than I could ever hope to express here.” It’s not only the blind in the little group who’ve been blessed; Pat, too, has continually been inspired by the people of Hope Vision Fellowship. “I love our group and all my blind friends across Canada. I come away refreshed from every meeting we have, and I know all the volunteers feel the same way. We all love ‘helping the blind see Jesus.’” Please remember this remarkable congregation in your prayers as they continue to reach out to the special needs groups in their region, paving the way for others to follow. When the charter group outgrew the hotel conference room, they began renting this local Adventist church for their monthly meeting. Talented church members contribute to the church service. Membership at Hope Vision Fellowship continues to grow, filling the meeting room to capacity. Through your support of Global Mission, churches like this are planted in areas or among people groups where there’s no Adventist presence. to share the good news of Jesus through wholistic ministry, such as providing medical care, teaching agricultural skills, offering literacy programs, holding evangelistic meetings, and giving Bible studies. To donate, visit Global-Mission.org/giving. Wilson’s outreach to the city of Cuiabá is a perfect example of Total Member Involvement (TMI). TMI is a full-scale, world church evangelistic thrust that involves every member, every church, every administrative entity, and every type of public outreach ministry, as well as personal and institutional outreach. To learn more about TMI, visit TMI.Adventist.org. followed Wilson on his trips, recording what happened inside his cab. “You can keep your money,” Wilson said to Rúbia Ceciliano, a middle-aged woman in the passenger seat, who at first wasn’t sure how to react. “I won’t charge you today; this is a special cab, a prayer cab.” A moment later, Wilson asked her whether he could pray for her and her family. Rúbia gladly accepted. After Rúbia got out of the cab, she was interviewed by Novo Tempo TV. “I found it a very noble and Christian project,” she said. “It moved me to tears.” “It surely caught me by surprise,” said César Augusto Santos, another passenger who benefited from the offer. “I was about to pay for his services, as you must, but then I found out that instead of money, I could pay by being prayed for,” he said. At the end of the day, Wilson shared his feelings with Novo Tempo TV. “I’m so thankful to God,” he said. “I found a way of working for Him by carrying people in my cab. It makes me feel so happy and honored.” By Dayane Nascimento and Marcielen Campos, Novo Tempo TV Network, Brazil. Adapted and reprinted with permission from Adventist Review. First Place Firsts I Rachel Fortunato is from the Dominican Republic and is studying communication and media at the University of Montemorelos in Montemorelos, Mexico. See the story Rachel helped film about the Adventist International Mission School in Thailand at m360.tv/s1843. Me with Marina and the translator after the interview. Bonding with the students at the Adventist International Mission School (AIMS) in Korat, Thailand. Me filming a testimony at AIMS. The “Dream” Job W From Brazil, Milena Fernandes Mendes serves as a volunteer English teacher at Tusgal School in Ulaanbaatar, Mongolia. She also cohosts a weekly news program there, the first Brazilian journalist in the history of Mongolian television. invitation to cohost a Mongolian news program! Just think, God had this planned all along, and I had been reluctant to accept His call because I was looking for a “dream” job. Serving as a missionary has been the perfect job for me. I’m not only happy; I’ve also discovered through answered prayer that God will always be there for me. better outside the 10/40 Window than it is inside. We celebrate the successes the church has had in sharing the Advent hope in Christ with the world! Thank you for all your support towards this end. But we also see the great work that remains before us. Please continue to support the ministry of Global Mission and Urban Centers of Influence with your donations and prayers so that everyone may hear the gospel. Source: 2018 Annual Statistical Report (Silver Spring, Maryland: Office of Archives, Statistics, and Research, 2018). eceiving a call to mission service, especially when God asks us to go to another country, is an amazing honor. It’s exciting and terrifying all at the same time! My family and I were called to serve at a school in the Middle East and North Africa Union Mission. Seventh-day Adventists. Even more amazing, after the baptisms, our pastor asked how many more students wanted to be baptized in the future, and 20 students eagerly raised their hands! The following story was written by Karim,* one of the 11 students who were recently baptized. The Sabbath I was baptized felt unlike any other. I was excited yet anxious. The week leading up to my baptism was full of spiritual warfare and indecisiveness. My family supported me, but something held me back. Doubts crept in. Is this really the best decision? I asked myself countless times that week. My spiritual growth started at our school. Throughout the year, my faith came together piece by piece like a house made of LEGOS®. But by baptism week, that house threatened to collapse. Questions flooded my mind. I felt as though I were drowning in uncertainty. Thankfully, the school community is blessed with people who are more than willing to help someone through spiritual difficulties. It took long discussions with the history teacher, frequent talks with the pastor, books that showed up at just the perfect moments, and endless prayers to finally put my doubts to rest. After Friday vespers, I had a long talk with Christ, after which I felt confident in my decision to publicly give my life to Him. the occasional “Oh, God” I uttered when experiencing difficulties. Despite all of this, God’s plans prevailed. Not only am I attending a school that uplifts God, but I’m also enjoying it! This school provided a conducive environment for my spiritual journey. To me, it’s more than just a school. It’s a sanctuary, an oasis that helped me quench my thirst for Christ—a thirst that I wasn’t even aware of prior to my enrollment. Just being at this school brings an air of community and a sense of belonging. It’s through this community that I managed to open my heart to Christ and truly learn what it means to be a Christian. The daily worship services, Bible studies, and the amazing vespers truly bless our student body. With all of these at my disposal, my heart could do nothing but open to Christ. I hope and pray that I keep the virtues I obtained at this school even after I graduate. I want to spread the good news that I've learned with those who haven't heard it. lives of young people. Our mission is to educate young believers to use their heads, hearts, and hands for God. Please pray with us as God continues to bless the school, our staff, and our students. The authors’ names have been changed and the school is not specified to protect their identities. The Chinese Railway and the Gospel Born in Russia, Galina Stele is the research and evaluation manager of the Office of Archives, Statistics, and Research. Aleksey Oparin is head of the Therapy and Rheumathology department of the Kharkov Medical Academy of Postgraduate Education in Ukraine. He is a church historian and the main editor of a medical journal and a journal on world issues in the Russian language. Preparing for a baptism in Harbin, circa 1924. Harbin citizens stand on the frozen Sungari River that flows through the city. Pastor Teofil Babienco, far left, and his workers on a missionary trip to Mongolia. The first graduates of Harbin Bible School, circa 1925.
teachers. The museum strengthens foundational beliefs for Adventists of all ages and professions. The purpose of NDM is more than just providing Creation education; its purpose is to touch people’s lives. Visitors who express an interest in learning more about the love of God are invited to visit a local Adventist church. Church planters also bring members of the community to explore the observatory. The museum staff follow Christ’s method of outreach: mingling, sympathizing, meeting needs, winning confidence, and bidding people to follow God. The NDM is an Urban Center of Influence (UCI) and part of a comprehensive, Seoul-wide approach to sharing the gospel, planting churches, and making disciples for Christ. This also includes an Adventist senior center and immigration center and Adventist restaurants. “We are proud to have this Urban Center of Influence,” says Pastor Si Young Kim, president of the Northern Asia-Pacific Division. “We want to encourage more students, teachers, and church members to participate in the program to have a greater understanding of Creation and the loving Creator who brought the universe into existence.” Please pray for this UCI as it seeks to reach for the stars in an effort to reach people’s hearts for Jesus. Story courtesy of the Northern AsiaPacific Division. The Nature Discovery Museum in Seoul, Republic of Korea. The largest telescope in the Republic of Korea, 48 inches across, is located at the Nature Discovery Museum observatory. Principals from the Republic of Korea’s public schools receiving Creation-centric training at the Nature Discovery Museum. 4	Students exploring the forest at the Nature Discovery Museum. A student views God’s creation up close using a telescope at the Nature Discovery Museum. initiative is part of the General Conference’s “Reach the World” strategic plan. Global Mission plays a vital role in starting new groups of believers and Urban Centers of Influence. To learn more about UCIs and to financially support their important work, please visit MissionToTheCities.org. Mission challenge: Each church must reach 210,345 people. * Data from fourth quarter of 2015, as reported by Northern AsiaPacific Division Secretariat during the General Conference “It’s Time!” Mission to the Cities report, Oct. 2016; Citypopulation.de. Puerto Rico Many things come to mind when one thinks of Puerto Rico: an island with a long and storied history, a rainforest teeming with life, and a warm and humid paradise that has survived the fury of tropical storms. For many, it’s simply a place called home. Here are a few recipes that represent the melded culture of Puerto Rico. Fresh Pineapple Salsa (Serves 4 to 6) If you think you don’t like pineapple salsa, this simple recipe might change your mind. Fresh ingredients and simple seasonings make all the difference. Try it with tortilla chips, or include it in a sandwich. 1. In a medium bowl, combine the pineapple, tomatoes, onion, and cilantro. 2. In a small bowl, stir together the olive oil, lime juice, garlic, coriander, cumin, and salt, and then drizzle over the pineapple mixture. 3. Gently stir until all ingredients are mixed well. 4. Cover and chill until ready to serve. For an instant holiday escape to a warm and sunny island, close your eyes as you sip this perfectly refreshing drink. Easily increase or decrease the quantities in this recipe to your liking—just use equal parts guava nectar and lemonade. 1. Stir together the guava juice and lemonade in a large pitcher. 2. Add a few lime slices to the pitcher, or garnish each glass with a slice of lime. 3. Serve over ice for a very cold drink. Baked Black Bean Burgers (Serves 6) Black bean burgers have earned a spot on many restaurant menus in recent years, but you can make them at home. You might want to make a double batch and freeze the extra patties for another day. Jicama Slaw (Serves 4 to 6) This tropical version of coleslaw is easy to prepare and offers a delicious variation to the usual cabbage salad. 1. In a large bowl, toss all ingredients together until combined. 2. Let the salad sit for at least 20 minutes before serving. 3. Stir again before serving. 1. Heat the oil in a skillet over medium heat. Add the onion, bell pepper, and salt. Cook until onions are translucent and the bell peppers are soft, stirring occasionally. Add the garlic, and continue to cook for 1 minute. Remove from heat. 2. Heat oven to 350 °F. In a large mixing bowl, mash the black beans. Stir in the rice, cornmeal or dried breadcrumbs, cumin, coriander, and paprika. Stir in the cooked onion and bell pepper. Let stand 5 minutes. 3. Use a 1/2 cup measure to scoop mixture for each patty. Press tightly, and form into patties. Place on oiled baking sheet. 4. Bake for 20 minutes, then flip the patties and bake for 10 more minutes. If you prefer, fry the patties in a small amount of oil until lightly browned on both sides. 5. Serve with your favorite sandwich fixings, such as lettuce, tomato, avocado, or salsa. Build your recipe repertoire at m360.tv/recipes. hat won’t happen!” one of the students exclaimed. “It can’t be done!” another assented. The students on my team of colporteurs continued to voice their skepticism. They couldn’t believe they could sell all seven books in their bags at one stop, what we called a “dump bag.” Their doubts started to weigh on me, even as I encouraged them to have faith. But inside, I was asking God to help me have faith too. Just 11 days after graduating with a theology degree, I accepted a call from Adventist Volunteer Service to be the literature ministries coordinator for a college in the Middle East. I’d oversee a team of colporteurs, students who would be selling Adventist books on health and spiritual growth door-to-door in the city. I’d also get to work alongside my best friend, Karen,* who had also volunteered at the college. I couldn’t wait to begin! I did my best the first few months, and I could see God’s hand guiding us as we made contacts in the city. But we weren’t selling nearly as many books as I’d hoped. I felt frustrated because I couldn’t speak Arabic with the locals and disappointed that there wasn’t more interest in our literature. Little did I know that God was preparing a winter of miracles for our team. The first day of the school’s winter break, I felt impressed that I needed to pray much more than I had been. I shared this with the team and invited them to join me in asking God to help us sell a two-volume set of spiritual books. Later that day, two of my students knocked on the apartment door of a young woman. They began to introduce themselves, but she didn’t let them finish. “Oh, you’re from the Adventist college!” she exclaimed. “My mom bought a health book from one of the students who came through last time. Let me see what you have today.” She eagerly bought a two-volume set of spiritual books. We were thrilled! The next day, we prayed that God would help us sell a three-volume set of spiritual books. Karen and one of my students, Helen, were selling books on a street lined with businesses. I happened to drive by when they entered a restaurant and sat down with a man who looked like he might be the owner. They were still there 30 minutes later, so I couldn’t help but wonder whether the man was wasting their time. It was time for lunch, and while I was calling everyone to meet up to eat, I received a call on the radio: “Mobile One, this is Helen: three-book set!” We praised God for continuing to answer our prayers! During our second week, Karen decided to train the students to get a “dump bag.” They responded with uncertainty, and even I was wondering whether we could pull it off. Monday morning, sales were slow, but that afternoon, God started to pour out His blessings. We sold three-book sets, fourbook sets, and even our first fivebook set! But the dump bag hadn’t come yet. Still, I was praying for it. About 15 minutes before quitting time, I heard one of the girls call on the radio: “Sarah, are you there? Sarah, I got a dump bag! I sold all the books in my bag!” Grabbing my radio, I exploded with joy. “Awesome! Praise the Lord!” As we drove back to the university, I reflected on the past few months. I was reminded of the experience of the people in Jesus’ hometown. Because of their lack of faith, they didn’t get to see Him perform many miracles (Matthew 13:53–58). I thought to myself, Have I been limiting God’s work in my life because of my unbelief? I asked Him to forgive my past doubt and help me trust Him to do great things. I believe God is using the colporteur ministry in the Middle East to open people’s doors and hearts. Please pray that my students and I will faithfully serve Him and that the people here will experience an ever-deepening knowledge of His love. * All names have been changed. 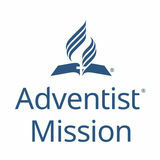 If youâ&#x20AC;&#x2122;re interested in being a volunteer, please visit AdventistVolunteers.org. Hannah Venn is a freshman at Andrews University in Berrien Springs, Michigan, United States. She and her family lived in Asia for 10 years as missionaries: 6 years in Thailand and 4 years in the Philippines. Thailand today, and only 14,000 are Seventh-day Adventist. That’s less than 1 percent of the total population! In the city of Bangkok, the capital of Thailand, there are 17.4 million people and only 1,700 Seventh-day Adventists. Du r i ng ou r six years serving in Bangkok, we led out or participated in various outreach activities around the city. Bangkok is built on a swamp, so the city has a big problem with flooding. This problem becomes quite obvious in the c i t y ’s m a ny s l u m communities. Open sewers and trash are everywhere, and people often don’t have enough to eat. games. The children enjoyed the program, and so did their parents. When we started passing out the rice, we gave each family one 5-kilogram (11-pound) bag. We also distributed baby formula to the mothers with young children and prayer cards and other literature to everyone. After we distributed the rice, we put the leftover bags into wheelbarrows and walked through the slum. We stopped at the homes of the elderly and disabled people who couldn’t make it to the giveaway location. As we gave out the rice, we sang songs and prayed with the residents. I remember one woman’s house we went to that was off the main concrete sidewalk. We had to walk on rocks or on wooden planks that had been laid down on concrete blocks to create a makeshift walkway over the dirty water. The water was a greenish color and had stuff floating in it, and the aroma attacked my nose. The rickety, wooden sidewalk was maybe one foot wide, so you had to be careful not to lose your balance because you’d be in for a very unpleasant swim. I wondered how some of these elderly or disabled people managed to get around such obstacles to travel to and from their homes each day. When we went into the woman’s house, our eyes had to adjust to the dimness of the room. It was a one-room house with no bathroom, no electricity, and barely any furniture. We gave her a bag of rice, and the pastor prayed for her. She was very grateful for what we were doing for her and her community, and she asked us to come back. This experience made me want to do more for missions and help those who are in need and who need to know Jesus. We went back to that community several times. The sweet woman who lived in the one-room house was baptized and became a missionary to her neighbors. Now, there’s also a church plant in her community, so they can all find the joy she found. One of the Thai slum communities we visited. One of the truckloads of rice for distribution. Hundreds of people lined up to receive rice and other resources. We were excited to help out so many families. I loved ministering to the local kids! Heart for Mission Just a few days later, Sarah was healed! Her heart was perfect! The doctor couldn’t believe it. Editor’s note: Joyce is a 25-year-old Global Mission pioneer serving in a country hostile to Christianity. She recently helped plant a church for young people in a city of 10 million people. Adventist Mission editor Andrew McChesney asked her why she decided to become a missionary, and this was her response. The doctor couldn’t believe it. He ran several medical tests, and he couldn’t find any problems with Sarah’s heart. It was a miracle! The mi racle changed my family. My grandmother and my parents started going to church every Sabbath, and soon they were baptized. Then my parents decided that they wanted to tell other people about Jesus. So they quit their jobs, received church training, and became Global Mission pioneers. When my sister grew up, she also became a Global Mission pioneer. Last year, I also decided to become a Global Mission pioneer. As a missionary, I give Bible studies, I pray with people, and I preach. I work with a partner, another Global Mission pioneer who is 23 years old, and we just opened a new church for young people in this city. Some of my relatives who aren’t Christians don’t understand why I am a missionary. They tell me to look for another job. My aunt even invited me to work with her, saying I could make good money and send some to my parents to help them. Sometimes I feel discouraged when I hear such negative words, but my parents pray for me. My mother even fasts and prays for me on Sabbaths. My parents remind me that I am not working for man. I am working for God. My parents are right. I am working for God. God was so wonder ful and power ful in healing my sister. I believe He is leading me every step of the way! Global Mission pioneers Global Mission supports thousands of local people, called pioneers, in starting new groups of believers among people groups where there is no Adventist presence. Their ministry wouldn’t be possible without your donations and prayers. Thank you for your support! This story and others like it can be found in the Children’s Mission magazine at AdventistMission.org/mission-quarterlies. Your child will have fun while learning the importance of giving to Jesus. Download and print the latest Mission Offering Bank coloring page from AdventistMission.org/ mission-offering-bank. Cut – trim the edges using scissors. Color – ask your child to use some fun colors to do the coloring-in. Wrap the finished coloring page around a tin can or similar container, using sticky tape (be sure there are no sharp edges). Save – encourage your child to place their dollars and pennies into the can. When the can is full, help your child count the money, and then write and mail a check to Adventist Mission. Taiwo and Onifade are Global Mission pioneers working in a city in southwestern Nigeria. Each day, they meet people, share food when they can, and help those who are ill or injured get medical care. Then they tell the people that Jesus has sent them to love and serve them in His name. Global Mission pioneers continue to make great sacrifices to be laborers in God’s field. On November 10, your sacrificial offering will help equip them with muchneeded resources to reach even more people with God’s love. Mark your tithe envelope “Annual Sacrifice Offering” or visit Global-Mission.org/giving. The pioneers face challenges that make their work difficult and wish that they had more Bibles and literature. But God is blessing their efforts to make friends for Jesus. When they arrived in this city, only a handful of Seventh-day Adventists worshiped there. By following Christ’s method of ministry, they have raised up a strong group of believers.